Cobe Freeburn of Durango High School led everyone, including Boulder’s Bjorn Riley, during the majority of Sunday’s varsity boys state championship race of the Colorado High School Cycling League. Freeburn, a junior, rolled in for a comfortable win and helped the Demons secure a second consecutive state title in Division 2. Riders, led by Durango’s Cobe Freeburn and anchored by Animas’ Riley Amos, make their way up the fly-over section of the course Sunday during the varsity boys state championship race at Durango Mesa. Six months ago to the day, Cobe Freeburn was in a hospital with a broken leg after a bicycle versus car accident. Sunday, the Durango High School junior was back on his bike in one of the best performances of his life. 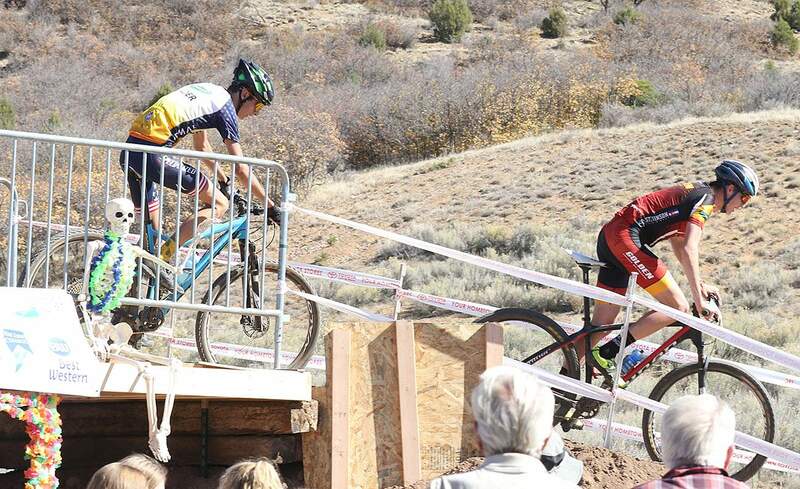 Freeburn went wire-to-wire to win the Colorado High School Cycling League varsity boys mountain bike state championship Sunday at Durango Mesa Park. He gave the Durango High team 575 points to help solidify the team’s second consecutive Division 2 state championship in the league, and the DHS team surrounded one of their heroes to celebrate the state title on home soil. Durango scored 4,846 points during the weekend that started with Colby Simmons’ win in the freshman boys race. Animas High was second with 4,233 points, and Highlander Composite was third with 4,034 points. Boulder won Division 1 with 7,479 points, while Fairview High, also of Boulder, was second with 6,913 points. Golden was third with 6,426 points. For Freeburn, Sunday’s win capped off a tough year in which he couldn’t walk for more than two months after the accident forced him out of the peak of the summer mountain bike season. 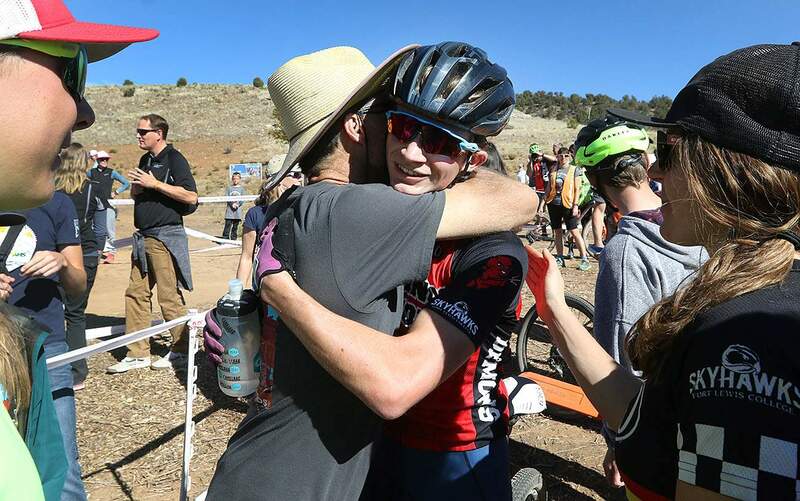 Cobe Freeburn of Durango High gets a big hug from his dad Mike Freeburn after winning the varsity boys Colorado Cycling League state championship on Sunday on Durango Mesa. 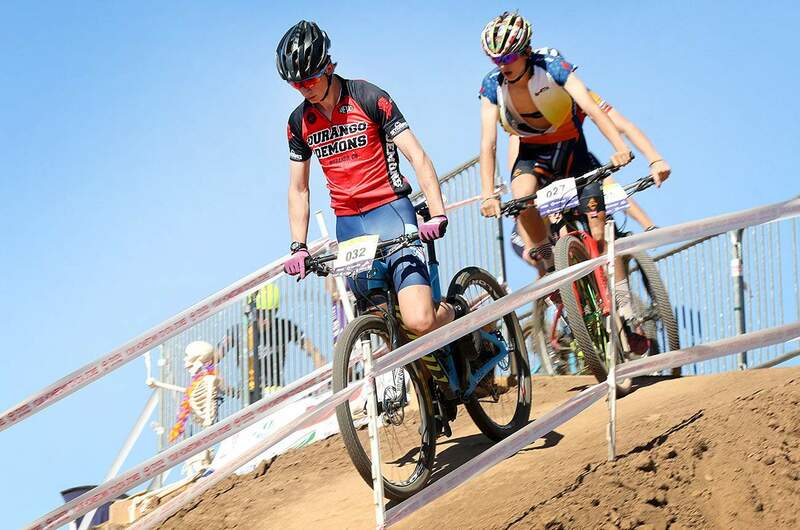 Freeburn’s win capped off a huge weekend of mountain biking, as 822 young mountain bikers hit the trails in the first-ever high school league race held in Durango. 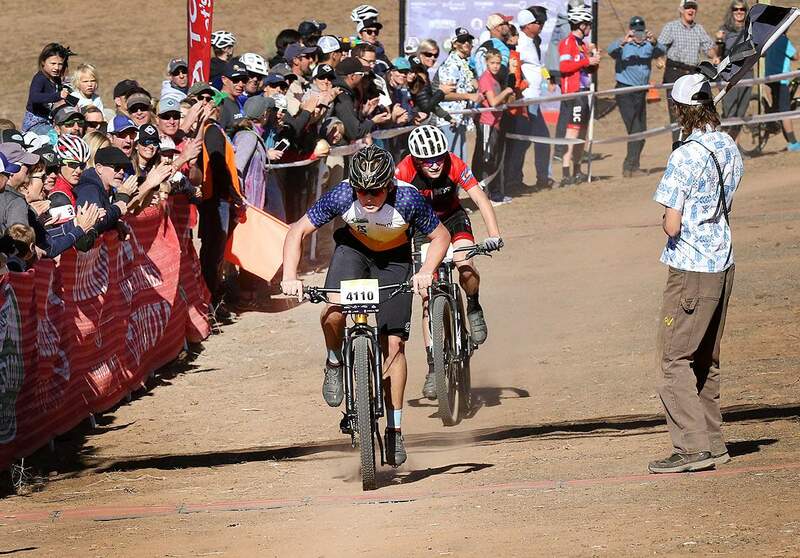 Freeburn fought off Animas High School junior and reigning cross-country mountain bike junior men’s 15-16 national champion Riley Amos, as Amos eventually faded to fourth place at the finish line. Freeburn came to the finish line alone in 1 hour, 47 minutes, 6.54 seconds after more than 28 miles of racing. He was 28 seconds ahead of Golden sophomore Ryan Campbell and 39 seconds in front of Boulder junior Jared Scott. Amos was the south conference champion during the regular season, and he was set to start Sunday’s race from the front row. But he missed his call-up and was penalized by being sent to the middle of the 89-rider field for the race. He had to give everything he had to get back into the top five at the halfway mark of the first lap. He eventually finished fourth in 1:48:16.36. Animas’ Riley Amos, left, and Durango’s Cobe Freeburn were alone at the front of the varsity boys race on the last lap, but Amos’ big effort on the first lap caught up to him, as he finished fourth, while Freeburn rode to a state title. “I mistimed my warm-up,” Amos said. “I think I got there like three minutes late, and they were already calling people up. I felt like an idiot. It was my mistake, and I paid for it. I felt good today and definitely could’ve been there for the win, but I gave it my all, and I’m happy with fourth. Amos was thrilled to see his friend Freeburn come through with a state championship performance. He helped the Animas Ospreys to a second-place finish in Division 2. Also for Animas in the varsity boys race was Simon Donnaway, who placed 25th in 1:58:23.18. There were 160 boys in Sunday’s sophomore boys race that was won by Peyton Wilkerson of Estes Park. He completed two laps on the 7.1-mile course in 55:11.66, 31 seconds ahead of Evergreen’s Zach Footer. Thorin Howell of the High Desert Devo composite team made up of riders from Cortez, Dolores and Mancos was third in 55:59.78. Howell lives in Cortez. Thorin Howell of High Desert Devo from Cortez pushes hard to the finish line to place third in the sophomore boys Colorado Cycling League state championship race Sunday at Durango Mesa. Animas’ Leit Schafer was the top-Durango rider in the sophomore boys class, as he finished 26th in 1:00:20.66. Durango’s Hayes Linney placed 37th in 1:01:32.50. 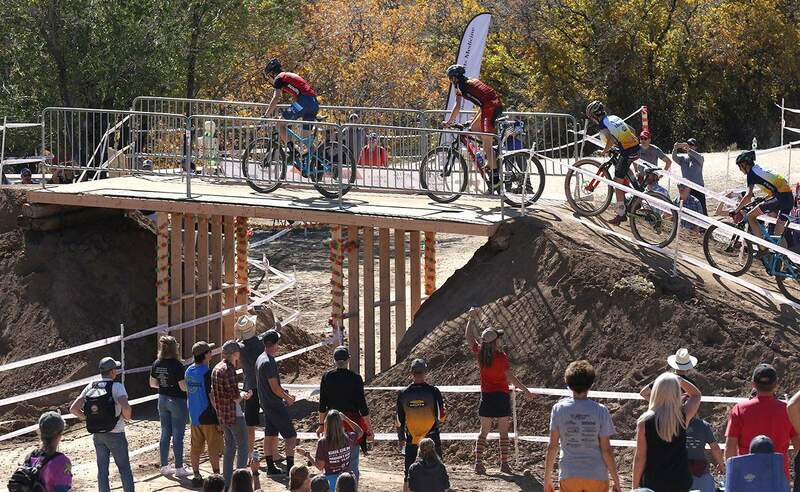 Across the board, it was a banner weekend for Durango mountain biking at a beautiful, never-before-used venue at Durango Mesa Park. A three-year quest to bring a Colorado League race to town proved fruitful, and league executive director Kate Rau said the league will definitely return to Durango for the state championships next season, if Durango will have it.